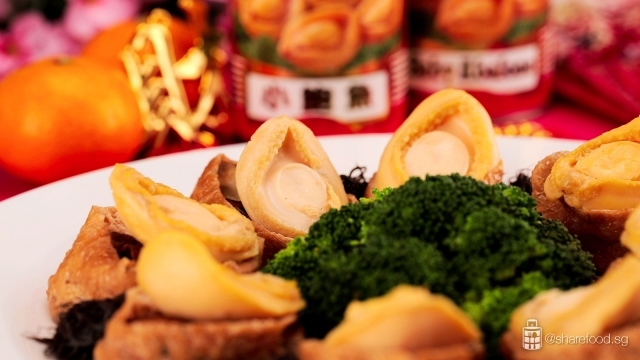 Did you know that eating abalone during Chinese New Year symbolizes good fortune? As we all know, abalone is an ingredient that is reserved for special occasions and festive seasons. There are many ways to cook abalone. But today, we are sharing with you a recipe fit for Chinese New Year! 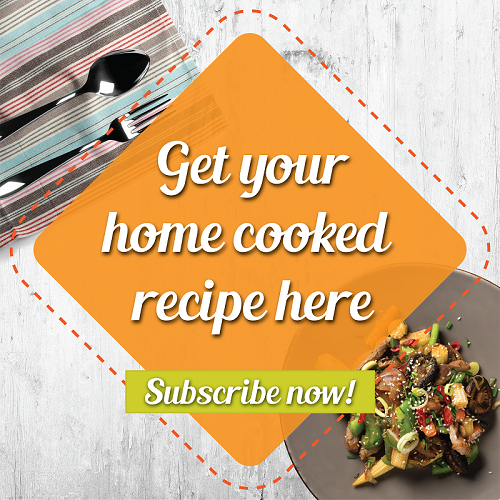 This recipe is shared by Anne Leong, a passionate home cook chef who loves creating healthy and tasty recipes! A recipe fit for Chinese New Year! 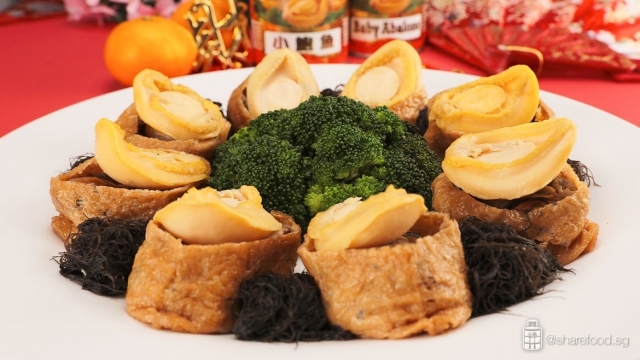 To prepare the Fortune Stuffed Abalone Pockets, you’ll need: 1 can of Fortune Baby Abalone, 10 Japanese bean curd pockets, 5g black hair moss, 8 small-size dried shiitake mushroom, 10 medium size dried oysters, 1 large carrot, 200g roasted pork, 1 large broccoli - cut into large florets, 600ml chicken stock, 6 cloves whole garlic, 1 tbsp wolf berries and lastly, Corn flour mixture that is a combination of 1 tbsp of corn flour + ½ tbsp water. First, let’s prepare the ingredients needed. Soak the dried shitake mushrooms and dried oysters separately in room temperature water overnight. Once the shitake mushrooms have softened, remove the stem and cut into 4-5 strips each. Next, cut the carrot and roasted pork into 10 slices each. Then, in a frying pan, heat up 3 tablespoon of oil and add in garlic. Cook till it’s fragrant and slightly browned. For the broccoli, blanch it in a saucepan for 1-2 mins. Do remember not to overcook the broccoli as it will lose its crunch! Then, remove the saucepan and transfer into a bowl of room temperature water to cool down. In the meantime, soak the black moss in room temperature water before cooking. Do ensure that the ingredients are submerged in the gravy! It’s time to stew the ingredients! Whip out your clay pot and add in chicken stock and oyster. Simmer for 20 mins until oyster is soft and set aside on a plate. Next, add in roast pork, mushroom, carrot, fried garlic and 600ml of water into the gravy. Do ensure that the ingredients are submerged in the gravy! Then, stir well and let it stew for 10 mins. Here’s where the abalones come into action! Add in the abalone and let it stew for another 6 mins. Expect firm, fleshy and succulent abalones! 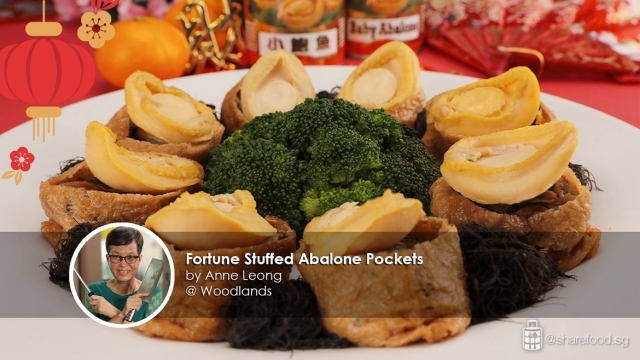 Fortune’s abalone are all ready to eat, which makes it a convenient upgrade to any of your dishes! Proceed to set aside before adding in the black moss to heat up for 1 min. Remember to turn off the fire while doing so! Remove all the ingredients from the gravy and set it aside for cooling. Then, add in wolfberries and corn starch mixture to thicken it and adjust the taste with salt and sugar as desired. Turn off the fire and cover the lid. Time to assemble the beancurd pocket! Next, assemble the bean curd pocket. 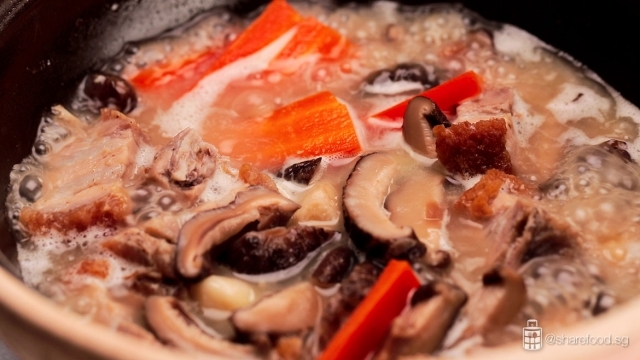 Once the ingredients have all been cooled down, assemble the ingredients into the Japanese bean curd skin in this sequence: carrot to form the base, roast pork, mushroom, dried oyster and abalone. 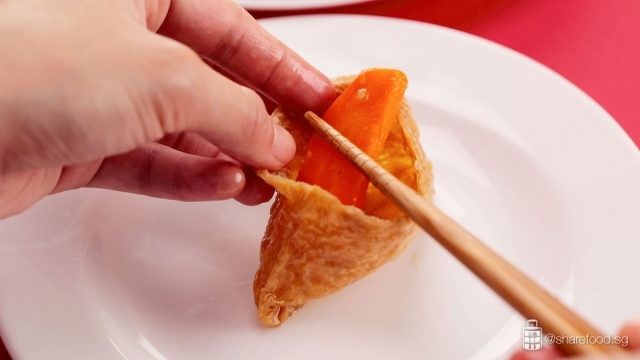 Trim the ingredients as require so that it can fit nicely into the bean curd pockets! Then, arrange it on a heatproof plate and let it steam for 5 mins. 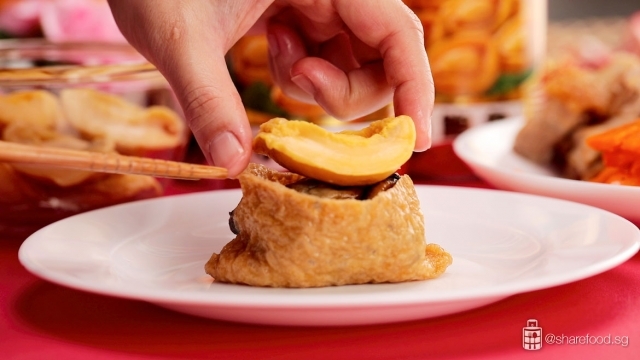 Lastly, assemble and serve these hot bean curd pockets! Arrange the pockets around the plate with broccoli florets in the middle and pour in the warm gravy over the dish and you’re done! Don’t you think that these bean curd pockets look like money bags? This dish will definitely be a centerpiece on the dining table as everybody reach in to grab their very own “money bag”! Don’t worry, there are 8 to 10 pieces of wholesome abalone in every can, so everyone gets at least 1 in the family! Here’s wishing everyone 恭喜发财, 财源广进! Dried Shiitake Mushroom: Soak in room temperature water overnight. Once it has softened, remove the stem and cut into 4 – 5 strips each. Dried oyster: Soak in room temperature water overnight. Carrot: Cut into 10 slices, 5cm (L) x 3cm (B) x 0.5cm (thickness). Roasted Pork: Cut into 10 slices, 2 cm (L) x 4cm (B) x 0.5cm (thickness). Garlic: In a frying pan, heat up 3 tbsp oil. Add in garlic. Cook till it’s fragrance and slightly browned. Broccoli: In a saucepan, boil water. Add in broccoli, blanched for 1 - 2 mins. #Tips: Do not over cooked it as it will lose it’s crunch. Remove from saucepan and transfer into a bowl of room temperature water to cool down. Set aside. Black moss: Soak in room temperature water before cooking. In a claypot, add in chicken stock and oyster. Simmer for 20 mins or till the oyster is soft. Remove the oyster and set aside. Add in roast pork, mushroom, carrot, fried garlic and 600ml water into the gravy. Ensure that the ingredients are submerge in the gravy. Stir to mix well and stew for 10 mins. Add in abalone and stew for another 6 mins. Set aside the abalone. Turn off the fire, add in black moss and let it heat up for 1 min. Set aside. Remove the remaining ingredients from the gravy. Set aside and let cool. Add in wolfberries and corn starch mixture to thicken it. Adjust the taste with salt and sugar as desired. Turn off the fire and cover the lid. Carrot to form the base, roast pork, mushroom, dried oyster and abalone. Trim the ingredients as required so that it can fit nicely in the beancurb pockets. Arrange it on a heatproof plate and steam for 5 mins. Arrange the pockets around the plate and broccoli florets in the middle. Pour the warm gravy over the dish.